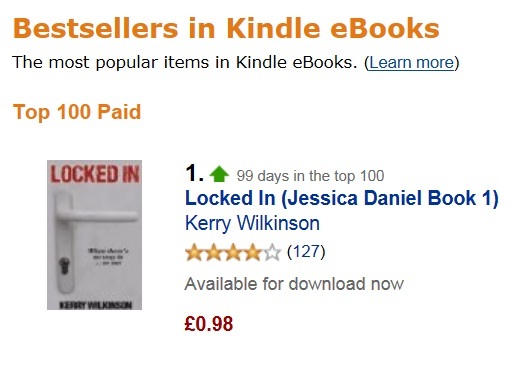 Locked In is about to spend its 100th day in the Amazon Kindle UK top-100 and, with a day to go, has returned to being the number one book for the fifth time. The Deal of the Day makes everything a bit yo-yo in terms of the chart, so I’m not sure how many other non-deal books will get to the top spot as it’s pretty hard. Of those 100 days, almost 13 weeks have been spent in the top-10 – with around 25 days at number one. Vigilante isn’t doing too shabbily. It has been in the top-100 for 12 weeks, with all-but around a week in the top-20. The Woman In Black is still in the top-20 too – as it has been practially since launch day in November. I get asked a lot about a release date for book four – Think Of The Children. All I can say, unfortunately, is that I don’t have anything concrete yet. My original aim was approximately Easter 2012. I will say there are complete first drafts of both book four and book five, so there will definitely be more Jessica in 2012.